Ironing your clothes may not seem much at first- but once you become busy and you won’t have time to do it, you’ll quickly realize how much you need it. 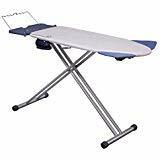 The best ironing boards are essential accessories that are used along with an iron or steam generator iron, for ironing or pressing clothing, fabrics or other textiles. 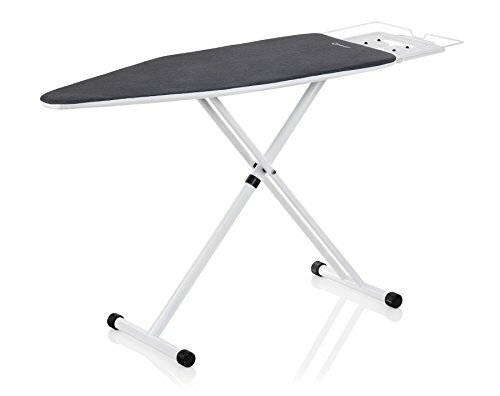 It is usually a long padded board often with collapsible supporting legs, used as a working surface for ironing. Here are the top ironing boards you should see for your daily needs! This board makes the chore of ironing easier! 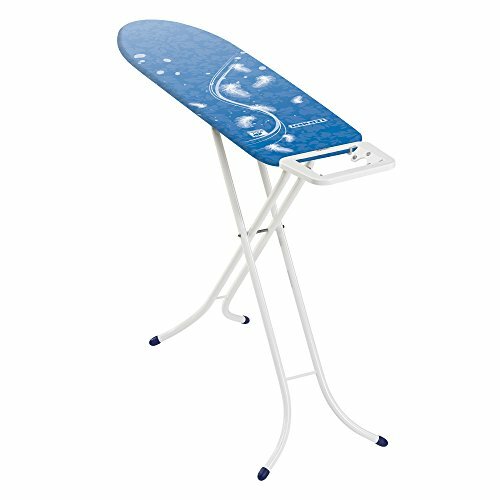 It’s much bigger than a standard ironing board, making more significant items much easier to iron. It has retractable wings that will surely help ironing shirts and blouses in one swoop; it cuts the time to finish the job. Whenever you’re done ironing, you can simply hang the board on the wall as it has hanging rail behind the iron plate. There’s also a basket attached to the board. The board has an attractive, well-padded cover as well. Overall, the item is strong and stable while in use with multiple height adjustments. However, the little wings that come out so you can iron a whole shirt back are not level with the board. They’re about 1/8 – 1/4″ below the board which, when you’re ironing, does actually make a noticeable difference so that you can see a mark where the wings have met the board- so you better be careful with that. Also, the wire piece off the back of the board where you hang already-ironed items is too low, so the items tend to drag on the ground. This Bartnelli ironing board is pretty sturdy. It’s wide, and it has perfect height level adjustments. There’s also a handy transport lock that keeps the table folded when stored or transported. It is a multi-layered board cover with extra thick 100% cotton that’s supported by foam and felt layers. 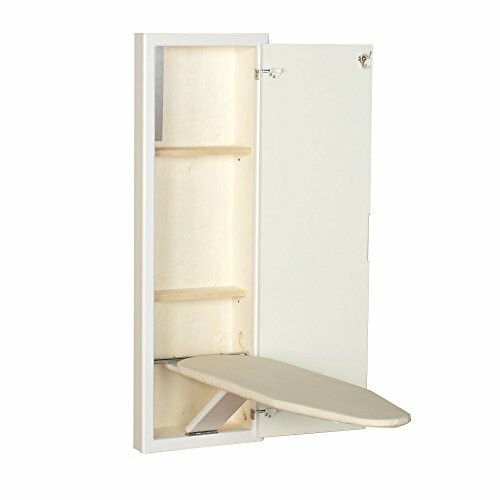 The board is only a few inches thick when folded for more accessible storage because the iron holder is not removable this board is best hung on a board hanger on a wall or door. The ironing board’s frame is made out of metal mesh. It’s also effortless to set up and take down. However, it still wobbles quite a bit, and the table itself is substantial, but the distance between the board and the table is large enough to catch the iron’s cord regularly. Also, its design isn’t that good. With this product, you can choose what size you want, what kind of design you’d like, and how height it is. There’re black silicone strips attached that are highly resistant, and a heavy-duty steel iron rest that’s welded on. The board is made out of steel and is powder-coated white, and it can be adjusted up t0 39,” and since it has seven different levels from sitting on up, it is perfect for anybody. It works evenly from either side. The foam/viscose padding is thick and seems perfect. There is a plastic part in this board. However, it’s the leg-locking mechanism that holds the legs in place when folded completely. The cover also has a tensioner to keep it taught at all times. However, there are times when one of the legs may be too short- making it unstable. 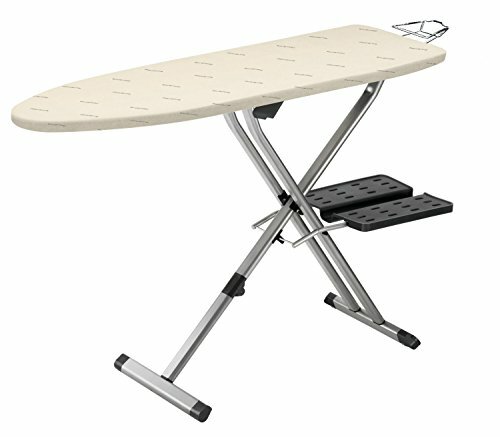 This is a hefty ironing board, and it latches or doesn’t latch to raise and lower the ironing. Since it is a very heavy board, by the time you flip it over to use it the adjustments have slipped out of the notches, and it’s way too tall or doesn’t catch. They need to work on the adjusting mechanism. There is a heavy-duty steel iron rest is welded on. You can choose what variation of the board you’d want. The board may be unstable. The height adjustment mechanism needs more work. This is a quality ironing board. It has a beautiful, thick cover and is easy to fold up and store and to set up, and is adjustable in height. It is very sturdy with a broad board, front legs, and isn’t too heavy. Their customer service isn’t too bad either. There’s a small metal clip that keeps the board in place by friction on a rod was about 1/8″ too long, it can get caught every second time in the expanded metal of the board itself. The whole contraption would either not stay in place at all, or collapse entirely at a given (but hard to determine) point. However, the board’s metal frame is prone to rust. The board is heat resistant. 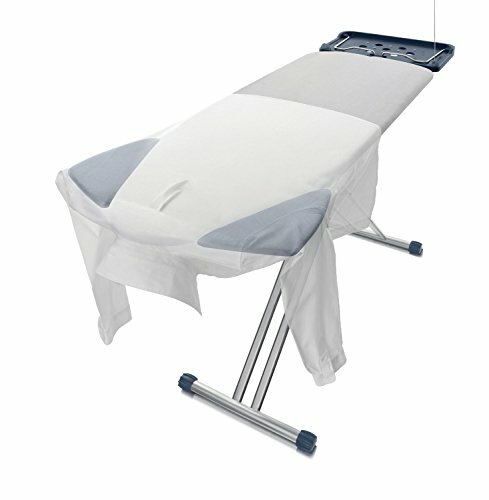 It has a unique and patented retractable shoulder wings- great for ironing t-shirts. Also, the pad is nice and thick; there’s no chance at all of having the wire outline ironed onto clothes. The caddy tray at the back is durable, and the metal frame construction is solid and sturdy. Sewers and quilters should note that the board is nearly rectangular with the shoulder wings extended. However, the drawer may be bent out of shape, and no amount of wrestling the metal would bend it back into shape, the wire hanger rack at the back isn’t high enough, and the wings! Oh, how that seemed like such a good idea. But alas, they are the downfall of this setup. First, the surface formed is not even with the rest of the board. So whenever you transfer your iron from one surface to another, you iron on a line. Second, they make it impossible to “spin” a shirt to the back. Third, when they’re folded under, they catch on everything. Whenever you slip a shirt onto the board, the wings catch the fabric, and you’re constantly unhooking or untangling them. Also, whether folded under or not, the wings are too wide or thick for people of smaller stature. With this product, you have the choice of what size do you want. Keep in mind that Extra inches of height setting option are awesome for tall people. Additional inches of overall usable board length is great for those who own longer clothing, tablecloths or longer skirts/formal wear. Its curved legs are also very stable. There’s also a detachable iron holder/stand. However, it can be frustrating to attach and detach and give up on doing so after two or three tries to scooch it out at the end without sacrificing board surface space. The quality of the board itself is great and excellent for ironing. The ability to choose what kind of board to get is a great idea as well. The ironing board is also pretty lightweight, you wouldn’t need to be a regular weightlifter in order to set this up. 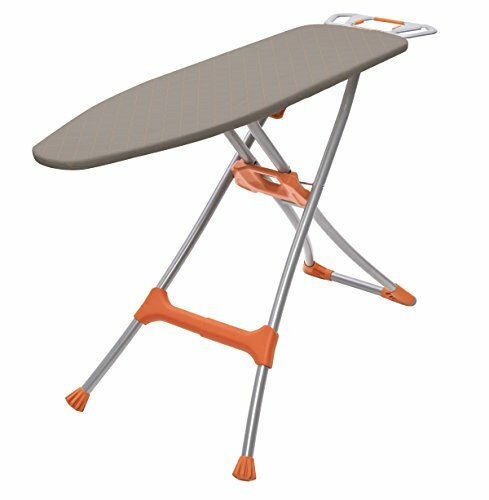 The folding design of this board is very cleverly designed so that it folds up shorter than the typical ironing board. The width of this board is also, but the length is deceptive, since part of the board is plastic, so the board would have ended up being shorter than an average board. It is heavy duty, no wobbling or rocking while ironing or moving clothes on the board. It is extremely easy to use as all the buttons you need to push to unfold and fold are clearly marked and are quite large. The legs are very sturdy without being heavy, and they fold and unfold with ease as the lever is quite large and responsive. The entire system functions wonderfully with room for any size iron. The surface is extremely large and allows for ironing large dress shirts, skirts, dresses, etc. with little movement and in short order. When not in use, you don’t have to worry about it being in the way as you can fold it up – making it easy to put anywhere when not in use – it even has wheels to help you move it, although it is not very heavy and can be lifted easily. The board is initially wrapped under a lot of plastic. 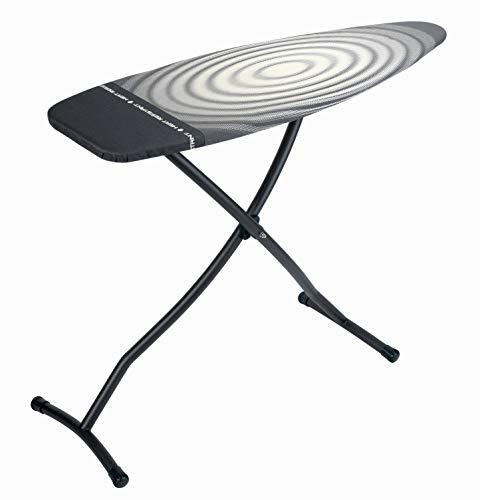 This is an ironing board has a decent design and functions well enough for everyday use. It has an interior box that’s made out of plywood with a paper thin face veneer. The interior box lifts up to one of the shelves. Also, it is too thin to take a clear finish or stain without it looking blotchy. The oak door is reasonably nice, but the screws are very cheap, not to mention that the heat shield (which is made out of metal) isn’t attached that well. It may look like it is stapled through the aluminum and into the wood. While the door and surround are actual oak, there is an oak-like trim around the sides. The construction of this ironing board is rather amateur it’s too long, and the board is fastened with gaps and discrepancies. Do take caution in attempting to sand things even as it is likely to end in a disaster. Overall, the ironing board looks and works well enough when all is said and done. However, there are so many shortcuts in quality and execution — all of which could easily be avoided. 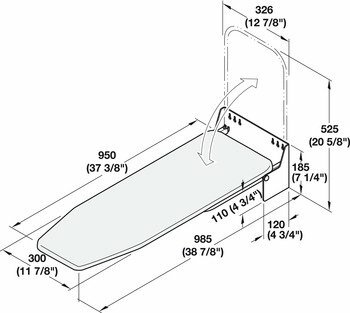 This ironing board comes with no loose or additional parts inside the box; all parts that you would need were all installed, functional, and ready to go. With a spring-loaded lever for its height adjustment mechanism, it’s easy to set the height of this board to up to 8 setups. The front leg and back leg are not level with themselves as opposed to each other. However, the ironing cord may become stuck between the tray and the board. There is a black notched metal rod underneath the board. It hooks into a white crosspiece to adjust its height. There is also a V-shaped aluminum metal however it is unclear on what to use this for. It could be a piece for the attached height adjuster. This board doesn’t close, so after reaching the lowest height adjustment notch, the board collapses. If you’re not prepared for the collapse, then you’ll be surprised when the board suddenly falls unto the floor. 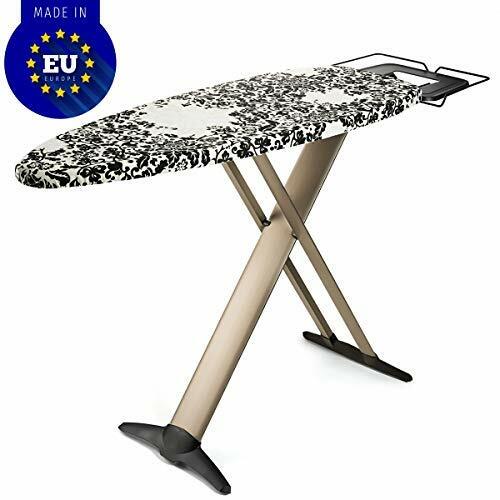 This high-quality ironing board is made in Germany. It works perfectly for tight spaces. However it is pretty heavy, so it isn’t recommended to drywall the anchors attached to the board. If not perfectly placed, there’s a chance that it will just fall to the floor. The standard height for ironing boards is 3 ft tall. You can use that as your reference for how high to mount the board. It’s pretty sturdy, but the front half of the ironing board itself tends to sag down as it’s too heavy. The cover isn’t secured well and eventually, the elastic gives out, and the cover comes loose and moves around. Also, the padding understandably flattens after a while, so it’s like ironing on a hard surface. Finally, there’s a stiff metal wire at the top which is responsible for pulling out support for the second half of the board.